Flood is, to be sure, one of those natural calamities that cannot be entirely prevented. But the most disturbing question is whether we could have done something to prevent the after effects of the flood from becoming so devastating? We could, but we didn't. This is not of course for the first time that Dhaka has been so badly affected by floods. Neither is the enormity of the humanitarian crisis we are witness to for the last few weeks in Dhaka, unprecedented. 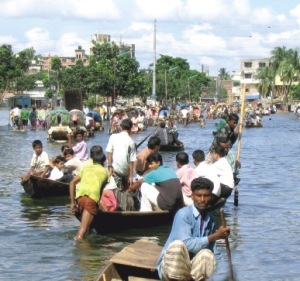 In fact, both the major floods in 1988 and 1998 did have more or less similar effects on Dhaka. But in spite of the bitter experience of the past our policy makers have remained indifferent to and lethargic about working out a long-term plan to make sure that the flood waters do not reach such levels as to paralyse normal life; so that relief is quick and efficient; and so that water-borne diseases are controlled and lives are saved. Thus, here comes another flood and yet again catches us off guard and absolutely unprepared.